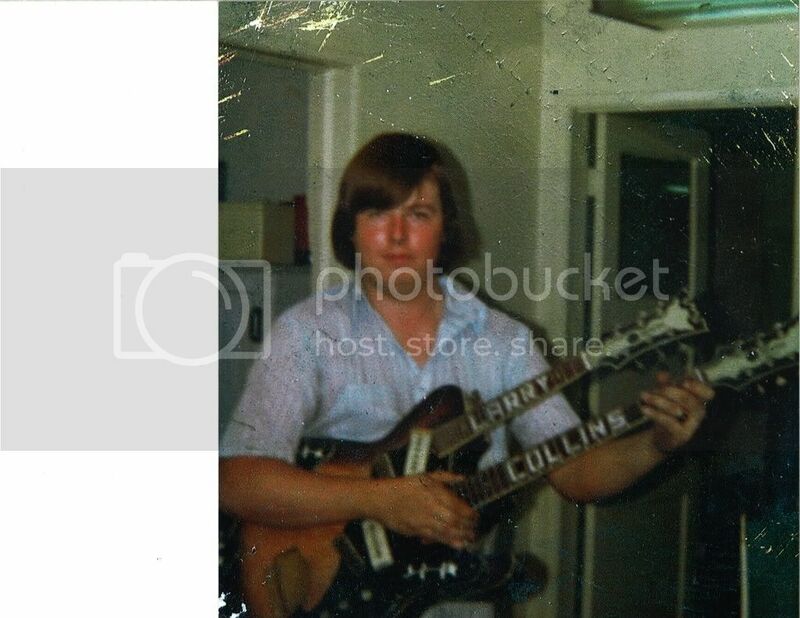 I've been going through my stash of photo's from the net of Mosrite double necks. It seems as though the only ones that were consistent in their design and appointments was solely the production Joe Maphis 12x6 model. Most of these are simply photo's minus any pertinent information. Feel free to post additional photo's or offer any knowledge you may have regarding any particulars. I just thought it would be appropriate to have a photo collection of double necks. Hey Danny, Gettin' that itch To build a double neck or two ??? late '63 to '66. I'll look for more double neck photos. Hey, Ed .. do you remember how many people were working there at the time. 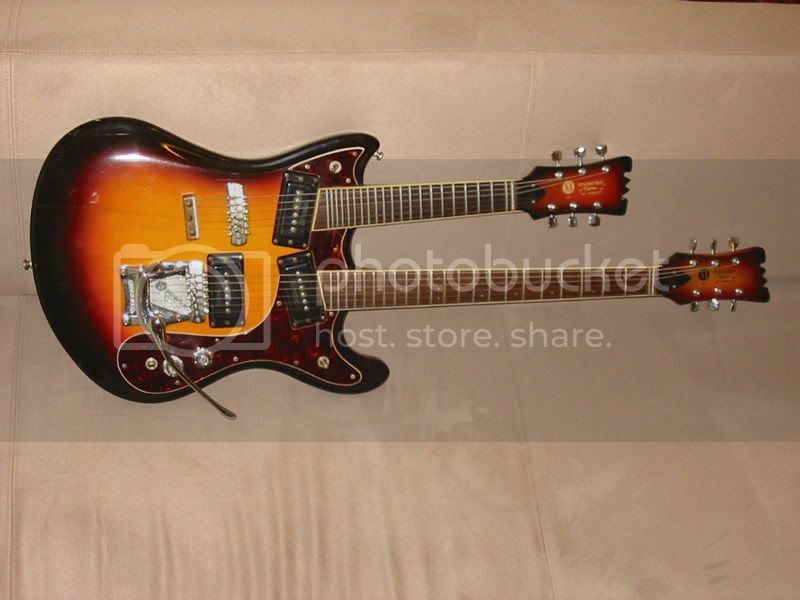 Just curious as to how many people Mosrite employed at any one time making these guitars. Can't forget Barbara Mandrell's 1981 double neck. I've posted pictures of my doublenecks on the forum already, though I still need to get a good photo of the Gino King doubleneck. 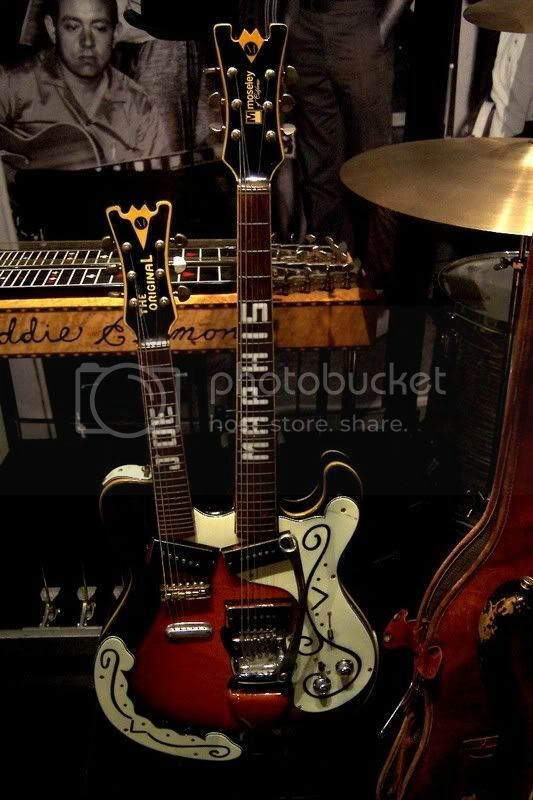 As far as "production" goes, these things started out as custom ordered instruments, and although the first one made for Joe Maphis had an "octave" neck on the top (essentially a 6-string guitar beginning at the 12th fret, or very roughly a 6-string with a mandolin scale length), you could custom order whatever the heck you wanted. Artie at Front Porch has one of the more bizarre ones I've seen, it has a 12-string octave neck! A little bitty neck with a huge headstock. 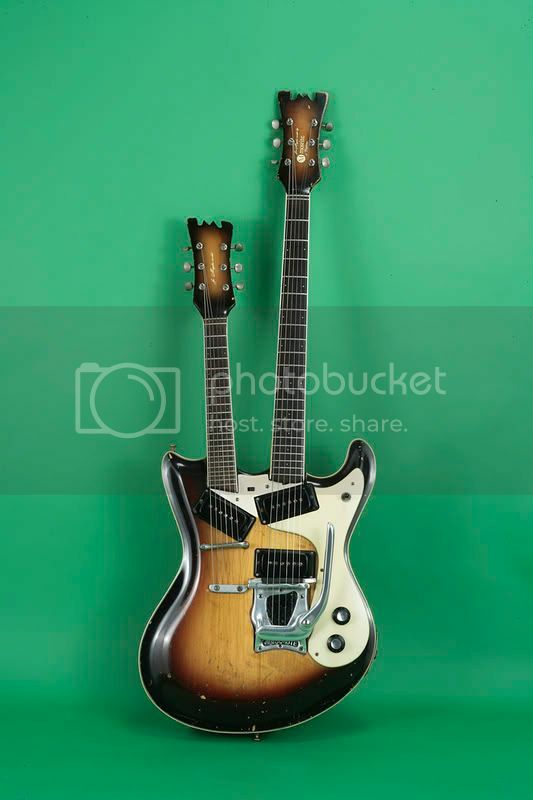 I've only seen two original authentic Mosrite doublenecks with a bass on top, very rare version. John aka Mosriteforever had that red white & blue double with the 8-string mando on the top neck and the 12-string guitar on the bottom, you'd wear out a tuner battery by the time you got that thing in tune! 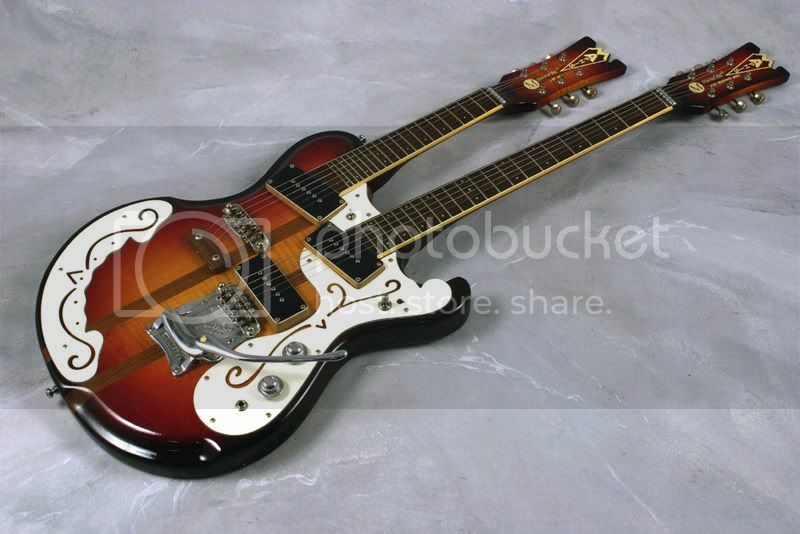 The only two "production runs" of Mosrite doublenecks were short lived. Even some of those were customized right from the factory. 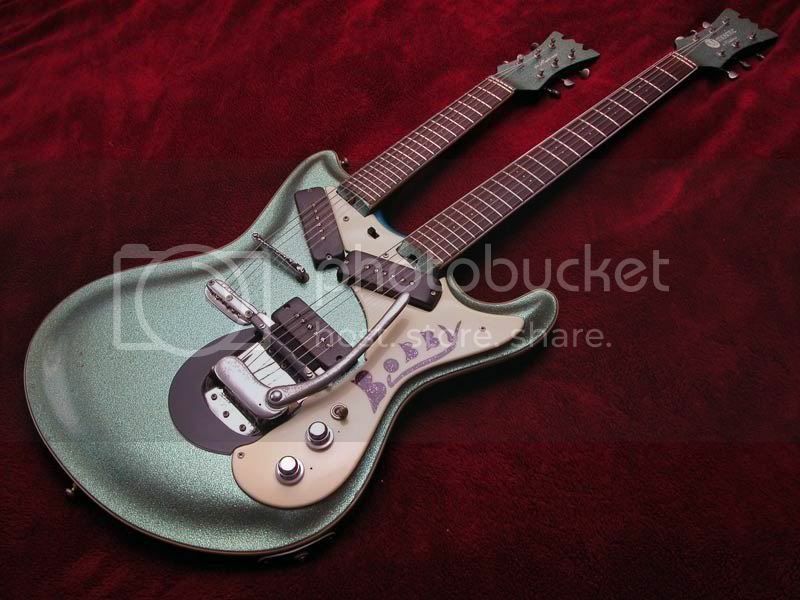 In 1966-1968 they made a bunch of the "Joe Maphis model" doublenecks with the 12-string neck on top. In the 1980's Semie made at least 25 or so of the "JM65" model, an homage to Joe's original doubleneck with the octave neck on top. Deke, since you own and have no doubt played a variety of double necks, does the octave neck get very much use or is it more of a novelty? It seems that the octave neck is the most common. I have to admit it is the most aesthetically pleasing, that 12x6 just looks out of proportion, but how practical is the octave neck? I realize that answer would be up to the individual style of music, but if one was to have 'one' double neck, what neck would be first choice? I'll open that question up for everyone to anser. dubtrub wrote: Deke, since you own and have no doubt played a variety of double necks, does the octave neck get very much use or is it more of a novelty? It seems that the octave neck is the most common. I have to admit it is the most aesthetically pleasing, that 12x6 just looks out of proportion, but how practical is the octave neck? I realize that answer would be up to the individual style of music, but if one was to have 'one' double neck, what neck would be choice? I'll open that question up for everyone to anser.